The Fauresmith Endurance Race is for the experienced horse rider looking for the ultimate test of endurance. An equestrian event that demands both skill and stamina from rider and horse, it is no ordinary horse race. Highlight: The great camaraderie and banter between contestants. The Fauresmith Endurance Race is widely regarded as one of the toughest equestrian events in the world: riders and their horses must complete 200km of high-speed off-road riding, over a wide range of terrain ranging from flat grassland to rocky slopes, in just 3 days. Although the Fauresmith Endurance Race is only open to experienced riders, it attracts over 300 competitors annually. Some of the more established riders to have competed in recent events include Ami de Wet, Claire Amm and Chris Thiel. During this horse race, riders must travel approximately 75km daily on the first 2 days, with a 54km ride on day 3 seeing them home. Horse safety is taken very seriously during the event, with compulsory 20-minute stops for veterinary checks scheduled every 20km. Horses that are deemed stressed or unfit are immediately disqualified. July is the middle of winter in South Africa and the evenings get very cold in the Free State, with temperatures dropping below zero. The days are warm and dry, however, providing comfortable conditions for the horses, riders and spectators. Accommodation in Fauresmith during this equestrian event is at a premium so it's best to book well in advance. Other accommodation options in the area can be found in the nearby towns of Trompsburg and Springfontein. The event was first held in 1964, following a debate in the Afrikaans agricultural magazine, Landbou Weekblad, about the fittest breed of horse. It has been held annually ever since. The NASTR 30-50-75 is on for June 4th in Dayton, Nevada. We have spoken with our vets and we feel it is safe to go forward with our ride. We will be requesting you to temp your horse before you leave home and we will be taking temperatures when you arrive at ride camp. Please bring a thermometer if you can. We will have some available. We will also be taking a few other precautions. If you decide too late to send an entry, please call us so we will have enough food for the BBQ lunch at the out vet check. We are marking trail and it is beautiful with lots of water in our little creeks throughout the ride. Don't miss out on a wonderful fun weekend with the fun Nevada riders. Marilyn here. I'm not even sure where to start. The awards are here, the trailer is half packed, 2 of my horses are in Glenwood waiting for me, but the rug has been pulled out from under my feet. Due to this EHV, the Glenwood Rodeo assoc. has closed their rodeo grounds to everyone including us. I went to a meeting armed with lots of updated information, Darlene, etc. But when they got word from the Washington state animal inspector that more horses were identified in Prosser Wa. They absolutely do not want any horses moving thru or around in their county, much less in their rodeo grounds. I think that some part of us all can understand their concerns, even though there maybe a "small risk", that is not "no risk". So sadly I have to report.... the Klickitat Trek I & II scheduled for June 4 and 5 in Glenwood, Washington is cancelled....I know that this is disappointing to many, including me. I am sorry. I also want to thank you all who have for years continued to support us. We are in shock, then we will work on regrouping. So watch for updates, keep your horses safe, ride smart. Maybe we will actually see you on the trail this year. I wanted to post an update for the NASTR ride on June 4th in Nevada. We believe as long as there aren't any new outbreaks between now and June 3rd the ride is on. We have talked with our head Control Judge, Dr. Jay Mero and we decided to proceed cautiously. If we see a new outbreak and decide to cancel the ride we will advise all entries immediately and post on our web site at www.nastr.org in addition to the aerc web site. The only request we have is for all participants to check their horses temperature before loading to come to the ride. As you know, if your horse has a temperature of 102 you will not be allowed to say at the ride. We will also be taking your horses temperature when you arrive at base camp in Dayton, Nevada. If you have any questions please call me at 775-267-4873. Endurance Ride in Washburn, Missouri that was scheduled for this coming weekend. Jody's farm was damaged and much fencing and several buildings were destroyed. inspect trails, and also put on the ride this weekend. Don't miss the action June 11-13, Toorbul, Queensland in the Inaugural Endurance Festival. Featuring riders from 13 countries. This will be the first time the entire FEI endurance committee has ever been assembled outside Europe and Nth America. 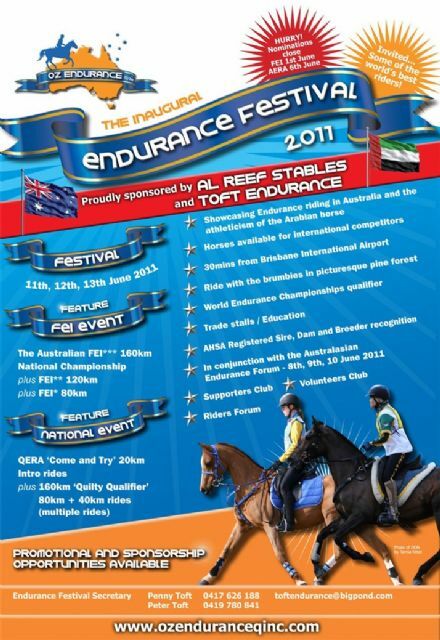 Proudly sponsorsed by Al Reef Stables and Toft Endurance. Enjoy a showcaseof Endurance riding and the athleticism of the Arabian Horse. FEI CEI3* 160km , FEI CEI2* 120km and FEI* 80km rides plus National events. All fees include the dinner meal for the rider. Extra Meals - $15.00 Entry form & PAYPAL is available thru our website! Veterinary scratches and refunds are subject to a $25 admin fee. MAXIMUM 50 HORSES!! – ENTER EARLY. barefoot, but protective hoof wear is recommended. All vetting is at base camp. Much concern has been expressed by the herpesvirus-1. Two suspected cases of EHV-1 are in New Mexico now, one in Albuquerque, one in the Hobbs area. The Office of the State Veterinarian is recommending rescheduling of all major equine events (gatherings of large numbers of horses) for at least the next 7-10 days. Therefore, for the safety of all horses, we are cancelling Ride the Divide, May 27-28-29, near Catron County, New Mexico. The welfare of the horse is the most important. We will be returning all entry checks and we thank you for your support. *Times listed are earliest start possible – All Jr. riders must wear a helmet! Early entries can be mailed to Ride Managers. Pre-registration recommended. **75 Mile Endurance Ride is AHA Recognized! Extra meals can be purchased in advance. PLEASE NOTIFY RIDE MANAGEMENT THAT YOU’RE ATTENDING!!!!!! Trail: Consists of grass fields, rolling hills, 2 track trail, section lines and gravel roads. Camping: All land used is private, please respect owners property. Camping will be primitive with water available and porta-potty. Camping fee of $10 for the weekend. Location: From Bismarck on Highway 83 to 136th Ave. NE. ( approx. 7 miles) Turn right and go East to 26th St. (approx. 1 mile) Take a left – follow the road North and it will curve onto 162nd Ave. NE. Follow the road 4 miles East. House is on the right. 8129 162nd Ave. NE Baldwin, ND 58521. From Wilton on HWY 83 to 136th Ave NE. Go Left (East) to 26TH St. (approx. 1 mile). Take a left – follow the road North. Curves onto 162 Ave NE. House is on the right. We are the only ride left in North Dakota! We would love to have some new riders come to this ride! Albocasser Raid to be held on Saturday June 4 at Albocàsser, (Castello) Spain. After weighing all the consequences associated with the handing horses due to the current EHV-1 outbreak we have decided to cancel the Sangre Scenic Spring - Pioneer Rides on May 27-29 at Westcliffe, Colorado. Not only would management issues be extensive. The policing of no contact and aseptic practices would be near impossible with the available staff and considering the communal culture of Endurance Events. One policy would have required all horses to be checked by a veterinarian BEFORE it entered the "grounds". If one horse in a trailer had a cough, runny nose or elevated temp, the whole trailer load would be rejected from the ride. This fact alone is not economical for the competitor who made the trip or the ride hosts. There are many many more requirements I won't enumerate. But, the biggest kicker was the possibility of infecting the remuda at Music Meadows Ranch. These horses are livelihood of the ranch and ranch family. We regret having to cancel. I have reviewed postponement dates with AERC and no available dates would fit. The good news is, we have a great chance of putting on a wonderful Fall ride. Elin and I regret not being able to host you for this Spring. We hope to see you at the Sangre Scenic Fall - Pioneer, September 16-18, 2011. The Lake Sonoma 50 will be held this year on June 11th near Geyserville, California. We want to let all you know that we are utilizing some New Trail this year!! It's beautiful and I'm sure you all will enjoy it. We found out a few weeks ago, that our last section of trail was not in the best shape. So we figured out some new places to bring you. This year all vet checks will be at Lone Rock(basecamp) and will consist of approx, 3- 15 mile loops. The first loop will stay basically the same, the second loop will utilize some new trail with part of the mid section from years past. The third loop will be the first loop run in reverse omitting the "down to the lake". We know you all will enjoy the new ride. Hey, no out vet checks and no trailering from the finish!! yeah. Thanks, and I hope lots of you awesome riders join us for some fun! Please join us for the 30th Anniversary of The Gold Country Endurance Ride held at Dru Barner Equestrian Park in beautiful El Dorado County, California. Dru Barner Equestrian Park was built by volunteers in a beautiful heavily wooded forest. Roads have been cut into the forest so there is plenty of room to park rigs. There is horse water but riders need to bring their own water. The park is located 6 miles east of Georgetown, CA off of Wentworth Springs Rd. in the El Dorado National Forest. Watch for the turn-off to Dru Barner and follow the ribbons 1.5 miles to camp. The parks elevation is 3200ft. so we expect a dry warm/hot day. The trail is a mix of single track and fire roads with the bulk of the single track trails on the morning loop. The first Vet check is at Darling Ridge and crew is not allowed. We like to think that we have the best away Vet checks of any ride and our wonderful volunteers will have everything that you and your horse may need. The hour hold is at Dru Barner Park and the final vet check is at the Georgetown Airport with easy access for crews. Gold Country is a moderate ride and weather can be a factor if it is hot. We require hoof protection as portions of the trail can be rocky and/or technical. 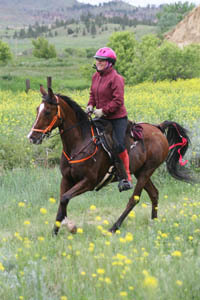 There are some very good climbs and flats that are perfect for cantering or extended trotting. Overall the terrain has very good footing with beautiful Sierra views, wooded forests and running creeks. We will have plenty of water on the trail. The 50 mile ride starts at 6:00am the 30 mile starts at 6:30am. Both rides have a controlled start. We are planning an extraordinary Saturday meal that will include fresh grilled salmon and bar-b-que chicken. We will have salads donated by local restaurants and fresh strawberry crepes for dessert. We will also have a selection of local wines and this is included in your entry fee. Extra tickets can be purchased and we would really appreciate advance notice! The pre-ride vet check begins at 3:00 on Friday afternoon and the ride meeting is at 8:00pm. All horses must be examined and numbered before starting the ride. Ride criteria and any last minute changes will be announced during the meeting. Gold Country has participation awards and you will pick up your award when you pick up your ride packet. We have awards for Fastest Time, Best Condition, Weight Divisions, first Junior and Tail End for the 50 mile ride. We also have a Horse of Excellence award for the 30 milers. We have kept our fees the same and hope to have a fund raiser in place for the American River Conservancy to help raise the $20,000 match needed for the $738,000 grant to build an Equestrian trail around a Mountain bike trail and a staging area at Salmon Falls Rd. on Folsom Lake. Entries must be postmarked by June 24, 2011 to avoid a $10 late fee and nonmembers of AERC will be charged an additional $15. We are offering a ride manager discount of $15 for those managing rides in 2011. There is an $8 fee for camping in the park and you will need to make payment upon arrival. Ride managers are Doyle and Pam Bailie (pamb@directcon.net) and the ride Secretary is Randy Hackbarth (trlryder@pacbell.net), she is unavailable until 5/28/2011. Please visit our website at www.gcer.org. We look forward to seeing you!!!!! NEW: Ride & Tie on day 3! Melanie Weir, President of the Ride & Tie Association, will give a "how to" talk after the general ride meeting on Saturday evening, May 28. If you've ever wanted to do R&T, this is your chance! NOTICE: We've come up with a solution for our lost trails and we think the new trails are better than ever! Sometimes when life dishes out lemons and you make lemonade, you find that the lemonade is better than you thought! We've added a brand new trail and modified two others for your riding enjoyment on Day 2 (Spring Trail); you'll do three loops and come back to camp for your vet checks for that day. How easy is that for those without crews? We also use one of the modified trails to make it just a wee bit easier on your horse on Days 1 and 3 - you only have to climb up to that lookout once. Otherwise - it's the same beautiful base camp, same great trail scenery! Hope to see you at Ride the Divide! Lunches will be served to Riders at the vet checks. Dinner meals will NOT be served. Riders will be on their own for dinner. The Diabetes Ride is this Sunday, May 15th in Eagle, Idaho (at the Y at Big Gulch). www.thediabetesride.org. We hope to see you all at the ride this Sunday to support this fundraiser for kids to learn how to live with their diabetes. If you happen to have a raffle item to donate please contact me or KC so she can get it listed on the raffle board or combined to make a really nice basket-o-goodies. The dealine for registrations, without a $10.00 "late fee" is approaching. Please let us know if you are coming. It will be a GREAT weekend. We must have a minimum number of pre-registrations, to continue, so sign up now. If you cannot attend, but would like to help the horses and ensure that we can afford to hold the ride next year, sponsorships (tax deductible to the rescue) are available. To register, contact Hope White at Hope@electricaldevelopment.com or 913-238-9528. Riders interested in taking advantage of our weekend Meal Deal (catered Friday and Saturday supper + Sunday lunch) must register by May 25th. Cost is $25. All proceeds from the ride will go directly to benefit the horses at Rainbow Meadows Equine Rescue and Retirement, Inc. Rainbow Meadows is a 501(c)(3) public charity whose mission is to provide a safe haven for abused, neglected and abandoned horses. All services provided by Rainbow Meadows are funded entirely by gifts and donations, and all contributions are tax deductible. For more information about the ride or Rainbow Meadows, visit our home page at www.rainbowmeadowsranch.com/rescue.htm or call Karen Everhart at 620-725-3402. We are still in need of volunteers who are willing support our efforts to put on a GREAT NATRC ride, all while raising money for the horses at Rainbow Meadows! Open spots include judges’ secretaries, P & R workers, and in-camp volunteers. Contact Karen Everhart at karen.everhart@rainbowmeadowsranch.com or 620-725-3402 if you want to lend a hand! Please consider a donation to Rainbow Meadows to support this fun event! Online Entry is open - use this form, it's easy! Thursday evening: Wine & Cheese Welcome Party - sponsored by Vettec! Come join us for another Fandango! Three days of riding in the Owyhee back country - from the high country juniper forests and magnificent rock formations - to the grand Snake River canyon at 2000ft elevation. Springtime weather - This is a beautiful time in the Owyhees with grass and wild flowers, water in the creeks and snow on the mountains. Sunday - 30/60/80/100 miles - River Run! (revised). Every day a different trail! Day 3 Trail & distance Revisions! The Hallelujah Again 25/50 ride on October 29 in Camden, SC has been cancelled due to loss of trail. The Black Mesa/Oatman 25/50 in Yucca, AZ has been rescheduled for May 21. Contact ride manager Chuck Dent at kbarmfeedstore at gmail.com for more information. The May 14 and 15 Turtle Mountain 25/50 in Manitoba has been postponed due to flooding. Watch for new dates! On-Line entries are available for the Fort Howes Endurance Rides at forthowes.net (forthowes 'dot' net). Ride dates this year are June 11-12. Location is near Ashland, Montana. Saturday we'll be hosting a 35, 50, and 75. On Sunday we're hosting a 55 and 100. Saturday's 50 will serve as the AHA Region 6 Championship with Sunday's 55 and 100 serving as AHA Local Rides. As usual our 50, 55, 75, and 100 are also FEI rides with Open and Young Rider Divisions. Trails circle out of basecamp onto the Custer National Forest with all checks in camp. Trails consist of unimproved jeep roads, cow trails, open meadows, and very little gravel roads. Basecamp is at 3,300 feet with trails climbing 1000' feet overall. We offer a HUGH basecamp with more than ample parking for every size rig imaginable...Dinner on Friday night includes sirloin steaks, potatoes, salad, veggies, and dessert. Saturday we'll have hamburgers/hotdogs on the grill. Looking forward to seeing our old friends and welcoming new ones! WHERE: Flag Springs Cons. Area, West of Washburn, Mo. NO DOGS ANYWHERE IN CAMP EXCEPT AT YOUR OWN TRAILERS!! Start times: 100 milers- 3:00am 50 milers- 6:00am 35 milers-7:00am 15 milers-9:00. All vet checks in camp. Limited water in camp, bring plenty of horse & human water. This is a beautiful trail to ride, from fast to slow, rocky to smooth. Plenty of water on trail, no bogs or mud. Three different loops. Please let me know if you are a new rider to this sport. DIRECTIONS: South of Cassville on 37 to Washburn. West on 90 approx. 2½ miles to UU. Right on UU to Flag Springs sign. Turn left onto dirt road at Flag Spring sign, at “ Y” stay to the right and continue to camp. If coming from the east on I-44 take exit 44(H, Monett, Mt. Vernon), follow H to Monett, go west on 60 to 37 south. From North & West, go south on 59 (old alternate 71) to 60. Go east on 60 to 37 then south. POT LUCK SUPPER will be after the last 50 milers finish on Saturday. Riders & families that arrive on Sat. for the Sunday ride are encouraged to join everyone for the potluck also. Sunday night potluck if we can all scrape up enough energy and leftovers. We always have!! (Gives time for management to get paperwork done)!!! Awards for ALL will be after supper!! If you must leave early please make arrangements for someone to pick up your things. Negative coggins required and health certificate for out of state horses. IF YOU WILL BE ARRIVING IN CAMP BEFORE FRIDAY, MAY 27 CALL ME. IF YOU ARE IN THE WRONG SPOT YOU WILL BE ASKED TO MOVE. All AERC and OCER rules and guidelines will govern this ride.